QMEAT-Probe ™ is a manual probe for the inspection of meat quality parameters. The probe allows to identify and classify PSE and DFD meats at line speed (> 600 pieces / h). The system consists of a stainless steel penetration probe that is coupled by optical fiber to a high sensitivity spectrometer. The probe is integrated in an ergonomic handle made of food grade plastic. The system determines a quality index of the meat that is related to the water retention capacity and the texture of the lean tissue. This index is established based on a spectral analysis in the range of Vis-NIR obtained inside the piece. The technology, patented, has been developed in collaboration with several producers and meat processors. QMEAT-Probe ™ includes a system of autonomous measurement that allows to define different indexes or degrees of PSE to make an optimal segmentation of the raw meat in different quality categories. 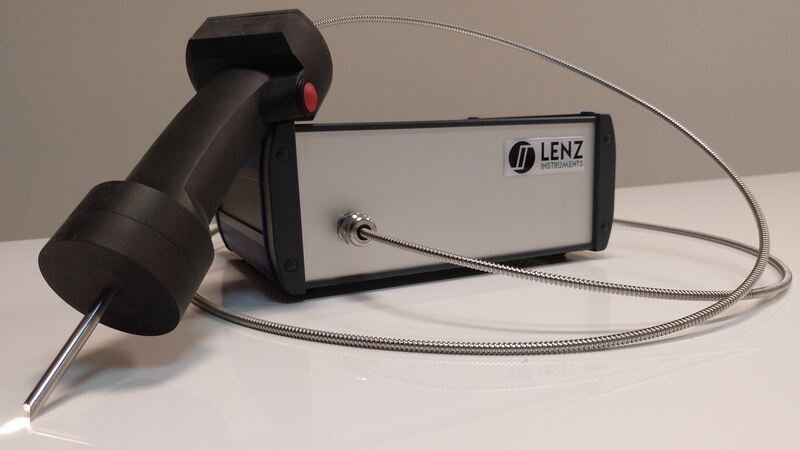 This probe has been designed to classify the raw material at line speed. The system includes a flexible communication interface that can be connected to a sorting system and / or to a database. The probe includes LED indicators that indicate the presence of PSE defects in the meat instantly. The system can optionally include a screen to display additional parameters of the production process. Connection to industrial bus. Integration with sorting systems. Industrial tactile screen (optional). It allows to monitor in a comfortable way and in real time process data including statistics by batch and by supplier. Remote diagnostics (optional): Secure access via Ethernet for remote diagnostic operations.